Get Hummingbird Book Here ! We have been involved in an ongoing project to photograph the hummingbirds of Costa Rica for the past three years. To date we have produced a body of work that includes fine art prints available by contacting us and also a print on demand soft cover book containing 31 full color hummingbird images that you can AQUIRE HERE. Our techniques capture an instant of time that not only shows minute details of the birds but also reveals their exquisite colors. 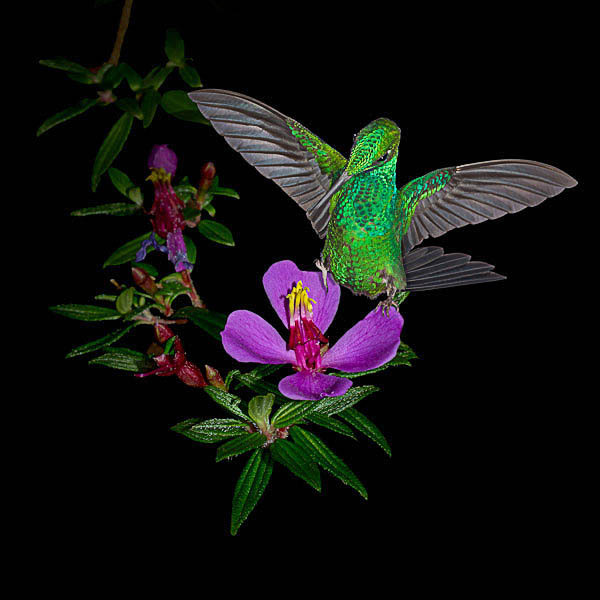 The images are photography based art with accurate depictions of the hummingbirds taken in the wild. Artistic license has been taken with the backgrounds and supporting elements to enhance the presentation. These images show details and colors of the hummingbirds not visible to the naked eye, presented in an enhanced setting . Although the work is based on photography, the goal is to present nature in a way that is both realistic and imaginary and that will transport the viewer to another place and time.The resulting images reside at the intersection of art and science. There are more than 300 species of hummingbirds that can be found in the Americas from southern Alaska to Tierra del Fuego including the Caribbean. The rest of the world has none and in the eastern part of the US there is only a single breeding species. Costa Rica alone has about 50 species located in different microclimates throughout the country. These creative expressions are intended promote awareness of the natural beauty of hummingbirds and enhance the likelihood of their preservation. © Copyright 2010-2011 Charles Fritsch, Cynthia Walpole.